The No. 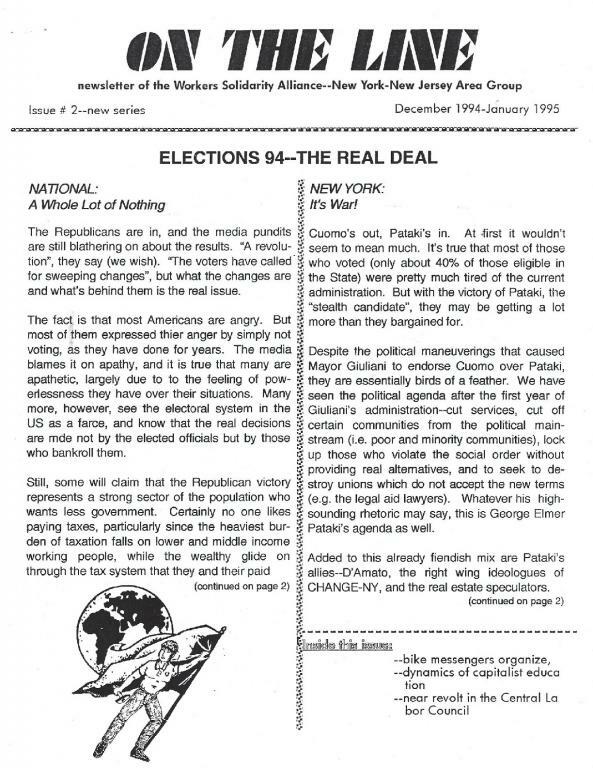 2 (December 1994-January 1995) issue of On the Line, a newsletter of Workers Solidarity Alliance in the New York/New Jersey area. - New York: It's war! great work scanning and posting these local working class papers (On the Line, Industrial Unionist, Workers' Opposition etc.). Is it possible to provide some more background information about how they were circulated or used as part of wider organisational efforts? Thanks AWW.... I'll have to come back on the OTL stuff, basically there were several approaches/experimentations over a longish period of time. I was not active with either the British IWW "Industrial Unionist" or the "Workers Opposition". What I can say, and I'm going from memory only here, is the British General Organizing Committee was composed heavily of expat Americans, though not exclusively. A read of the issues posted doesn’t give one a sense of a lot of activity, mainly getting the word out and so forth. “Workers Opposition” I recall as being an “anarcho-Wob” magazine. I believe they only published one issue.